Apple's newest operating system, iOS 11, is seeing slower adoption rates than iOS 10 saw during the same adoption period last year, according to data collected by analytics company Mixpanel. As of 10:00 a.m. Pacific Time, 24 hours after iOS 11 was released, the OS is installed on 10.01 percent of devices. 24 hours after iOS 10 was released last year, it was installed on 14.45 percent of devices. iOS 9, after its release in 2015, was installed on 12.60 percent of devices 24 hours after launch, and iOS 8 saw similar adoption rates in 2014.
iOS 11 was not affected by installation issues or other problems like iOS 10 was, but past issues with new iOS releases may be keeping some users from upgrading right away. The iOS 11 update also disables all 32-bit apps, another factor that could be holding some users back. 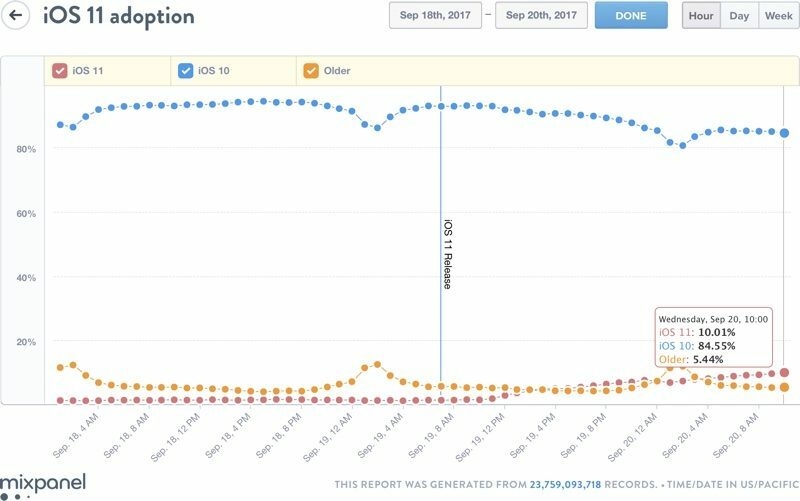 Adoption rates often spike up a bit over the weekend when people have more free time to make major software updates to their devices, so iOS 11 could catch up to iOS 10 at that point. As people begin adopting iOS 11, iOS 10 adoption is trending downward. iOS 10 is now installed on 84.55 percent of devices, while 5.44 percent of users continue to run an older version of iOS. iOS 11 is a free download that's available for download on the iPhone 5s and later, iPad mini 2 and later, and the 6th generation iPod touch. There are dozens of new features in iOS 11 and several overhauled interface elements, so it's worth an upgrade if you haven't already. For full details on what's new iOS 11, make sure to check out our iOS 11 roundup. iOS 11 doesn't "disable" 32-bit apps. It simply has no 32-bit libraries in order to tun them. I didn't kill him your honour, I simply pulled a trigger that released a teeny-tiny hammer. Yep, sounds about right; I opted to install iOS 11 on the top tenth of my iPhone. My company (10,000 employees world wide) advised us not to update because of the outlook bug. I mean, it's only been 24 hours. My wife only installed iOS 11 on her 7 because I told her about the update. A good amount of people I know don't know there is an update until they see the '1' notification in the settings app. This is bad. 50% battery drain in less than hour just going on Facebook. And phone hot to touch. Not happy. This is on iPhone 7plus. Why can't apple test their iOS fully before release. Every B****y time this kind of thing happens. Puts you off iPhones for good. I haven't heard android becoming useless after every update! I have 90 32-bit apps, that will not run under iOS11. OK, I blame the developers. But that doesn't help. I won't update to iOS 11. IOS is a lot better than android. Never going back. The new control center and customization of iMessage app order is very welcome. But touchid to get to home screen feels slower, and the massive titles in apps like messages, mail, and phone are just awful. How did those make it through. So much white space. Also, the new app store is the worst.